Usually my philosophy class fills me with untold dread. Between the far-fetched thought experiments and dramatic fights that occur between my classmates, I usually spend class periods perfecting my doodles of trees and piglets. 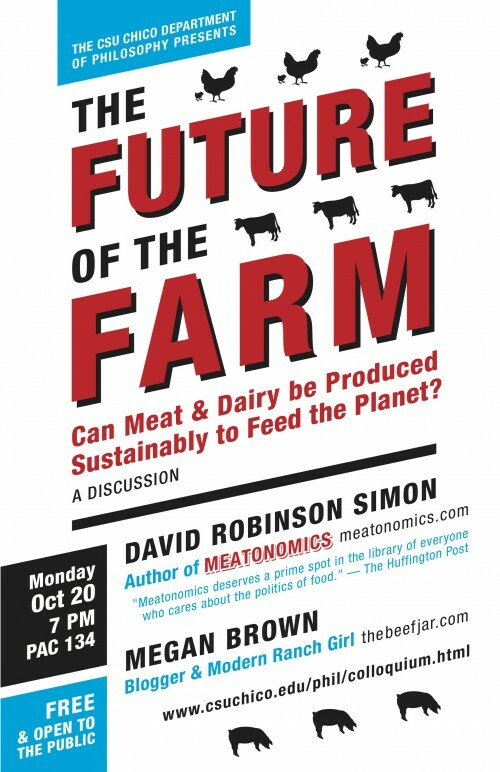 However last Monday the philosophy department at Chico State hosted a event called “The Future of the Farm.” The event was a panel with Dave Simon (author of Meatonomics) and Megan Brown (author of Beef Jar) as they hash out a couple of topics that were key to agriculture. 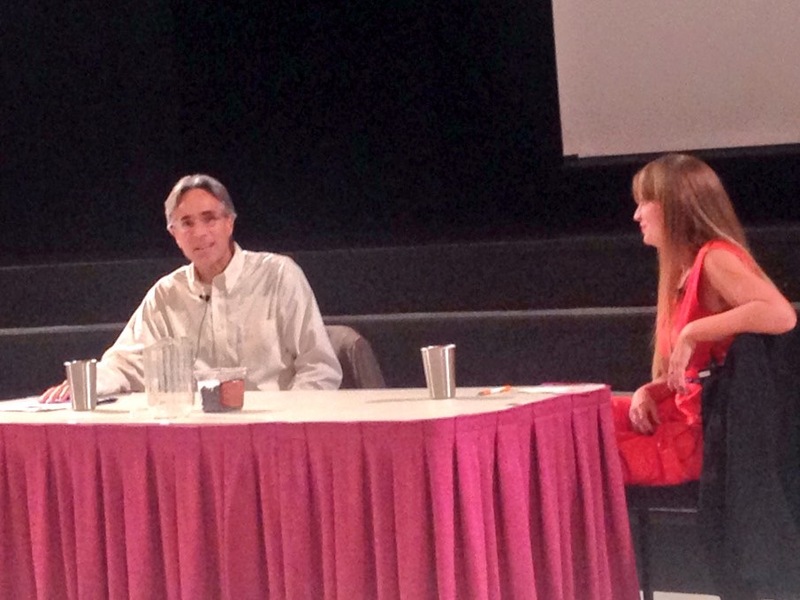 The night started out with a presentation by Dave Simon which was based loosely on his book Meatonomics. 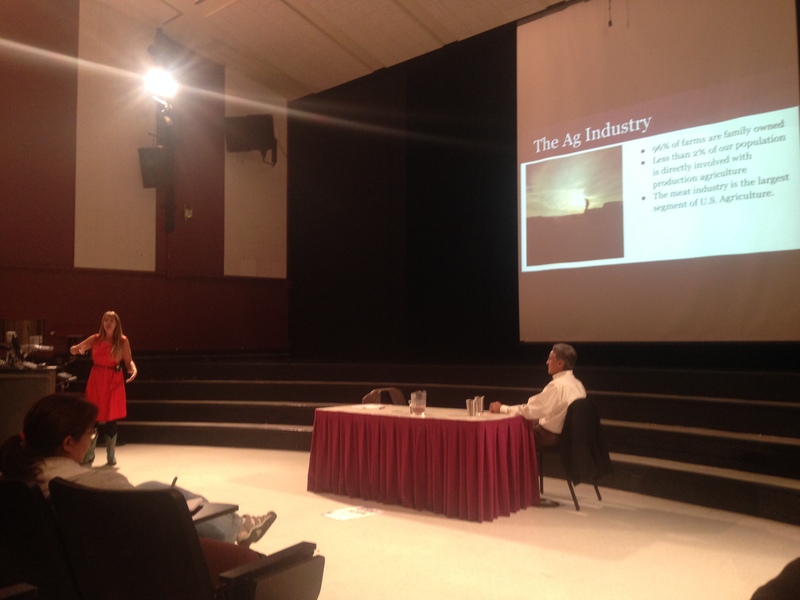 The presentation covered various agriculture laws, consumption of meat, and the difficulty of sustainable agriculture. Obviously we have a difference of opinions on some of the issues. I appreciated how his argument didn’t turn into a agriculture hater session, but instead presented facts and figures that were well developed. (Well from his point of view anyways.) The main thing that I took away from his presentation was the inability of “All farmers to switch to ‘sustainable’ farming methods” because of lack of resources; something that I hope to explore further on and research myself. Megan Brown, a beef rancher from Chico California, was able to dispute some of the more common misconceptions in the room. Brown brings up the point that “agriculturists are our own worst enemy” and that we need to “open our barn doors” and let consumers experience agriculture. One of the bigger misconceptions that she tackled was “factoring farming” and what is perceived and what actually happens on her ranch. The real goldmine of the night however, was when the two panelists were able have a discussion with the audience. The great thing is that no one was condemning each others views and lifestyles. Instead, both speakers were able to come together to foster a discussion that would help promote a better world for agriculture. We should all eat more beef– Brown was particularly happy about that. *redraft: upon further clarification Simon did not propose beef, but that if he did eat beef he would like to get it from a ranch like Brown’s. Waste is horrible, and we should only buy what we will consume. And that talks like this should happen more often. After the conversation I went to address the mediator (My philosophy teacher) about his comment about agriculturist students not showing up to the event. It was really disheartening to see that I was the only ag-minded student there. However, when I asked students the next day about why they didn’t attend, most hadn’t even heard of the event. One of the students that I did talk to said that she was scared to attend the event because she thought it was going to be a hour of bashing agriculturists. And with a midterm to study for, it wasn’t a high priority on her list to be bullied for her chosen career. Just be willing to talk, and be understanding about common misconceptions. I agree that we should open our barn doors like Brown said. It might be hard, it might be down right scary, but its the right thing to do. I was so thrilled to have an agriculture student in the audience! And one with a blog to boot! Check her out, won’t you? Hi Kristen. Nice blog! Hey, just a couple of things. First, to clarify, Dave Simon did NOT recommend that “we all eat more beef”. I double-checked with him before posting this comment. He did say (a) IF he ate beef, he would eat it from a place like Megan’s and (b) some people argue that eating chicken is less ethically defensible than eating beef because, pound-for-pound, eating chicken involves taking more lives. Second, it’s interesting that the event was not promulgated in the Ag College at Chico State, especially since (a) the Dean of the Ag College was asked to announce the event to his College, (b) the Dean of the Ag College and the Ag College Office were sent event fliers and asked to post them around the College, and (c) posters announcing the event that were posted all over the Ag College and the buildings where Ag students take classes were torn down soon after being posted. Obviously, the reason why most Ag students hadn’t even heard of the event is because they weren’t supposed to have heard of the event. The sad thing is that the Ag College feels it has no need to participate in one of the foundational aspects of any university, namely, the free exchange of ideas. My hat is off to Megan Brown for doing what the Ag College and the CCA refused to do, namely, courageously and forcefully defend the rancher’s way of life. Thanks, Kristen. Just for clarification purposes was the flyers stamped by the university poster office, I have had a couple of issues with posters be taken down if they haven’t been stamped and hung in right spots. Just curious. Hello I am a current agriculture bussniess student at Chico State—in my argriculture issues class we were told about this event, and that we should attend this event to see a different viewpoint of agriculture. I am dismayed that you think that we are not open to different views. I was not able to attend because of midterm season and a slew of homework projects. Let me explain the agriculture issues class (its is a required capstone class for all agriculture majors) it talks about showing both sides of each issue, and encourages us to develop understanding about the world around us. As a former student of your American Indian Enviromental phil class, its rather shocking to see that you would lash out against the agriculture department and thier view of free exchange of ideas.